theSun: Why do you think the practice of name-calling and usage of unparliamentary words in the Dewan Rakyat has become a culture that is acceptable now? 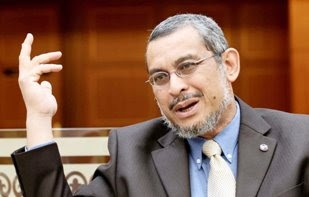 Khalid: All the unparliamentary words, name-calling and the like should not have happened. And in most cases, we see the same people doing it. One or two Pakatan Rakyat MPs do this but this is not something we condone or encourage. Perhaps it happens because the situation in Parliament now is more tense with a larger number of opposition (MPs). Earlier the voice of the Opposition was not too obvious. But now with more opposition MPs, the issues raised are seen to be more challenging. So, the bigger number of opposition MPs contributes to this culture? It should not be a contributory factor but maybe the BN MPs are not used to this kind of environment, they find it intimidating. So when they feel intimidated they are not able to present their arguments rationally. Then, they try to give a bad image to the Opposition by using tactics to challenge us and that sort of thing, or give the impression that we are not calm and cultured. They resort to this kind of words in reaction to, supposedly, what we have said. For example, they said even the word "kamu" (you) is rude and disrespectful. They said I should address the MPs as Yang Berhormat. They are trying to show we are the cause, but it is their inability to accept the fact that the politics of the nation has changed and they are no longer dominant. The sooner they accept that, and the sooner they realise they need to re-think some of their strategies, the better. But when they are not willing to think about it, in the end they resort to using such terms. It is for the lack of strong and consistent arguments that they have to resort to this kind of tactic. What do you think of Pasir Salak MP Datuk Tajuddin Abdul Rahman’s request for the Speaker to allow backbenchers to reply to the Opposition? It shows a lack of confidence in the ministers. They feel dissatisfied with the answers given by the ministers. That’s partly the reason. The minister has all the time he needs to explain the issue, but I think it’s obvious to the BN MPs that some of the ministers are not able to handle it. That’s why they want the backbenchers to reply on behalf of the ministers. p/s: Many thanks to Fahmi, for the information.